Thank you to my friends at JetPens for sponsoring this post. Because of their sponsorship, the calligraphy supplies pictured in this post were free to me. I was not otherwise compensated, and this post reflects my personal experience with the products. I don’t really think too much about my handwriting, though I generally like how it looks. Though some folks have wonderfully consistent handwriting (Hi, Azizah! Hi, Brad! ), mine varies depending on the pen, the paper, and my mood. If I’m in a rush, it’s not that great. If I’m taking my time and loving the pen, ink, and paper I’m using, it looks pretty good. It IS, I will admit, MUCH better than it used to be “back in the day.” I’ve received some lovely compliments (always appreciated!) as well as a couple of blog comments asking for handwriting advice, so here are my thoughts. So I picked up an inexpensive Sheaffer calligraphy set and a calligraphy workbook and spent hours hunched over practice paper. HOURS. I never DID become a very accomplished calligrapher—school and life eventually got in the way— but after all those hours of practice, a funny thing happened. My random, immature, tilt-a-whirl handwriting became more uniform, tidier, and infinitely more mature. It wasn’t Victoria’s, but it was a much-improved version of my own. Finally, I had handwriting that had a bit of style. 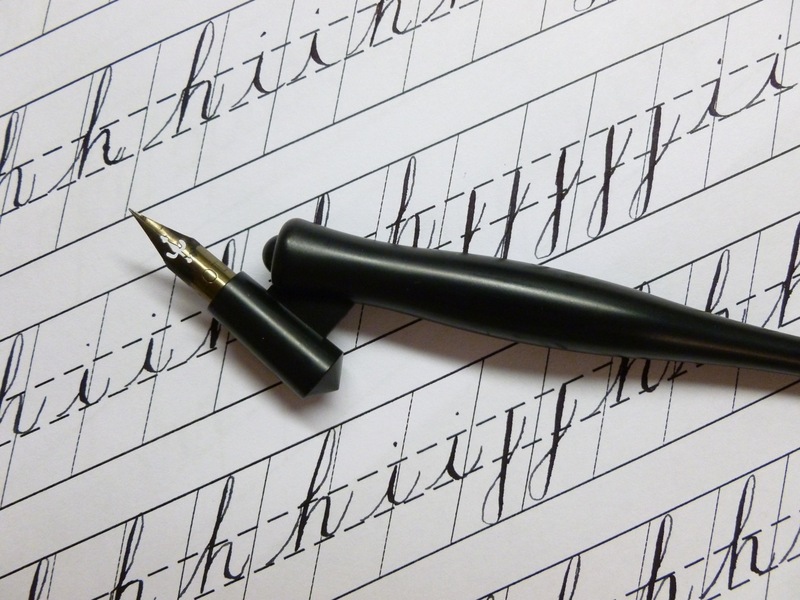 Through the years I’ve informally worked to refine my handwriting further— by writing, writing, writing, and writing. And while it’s true that writing with a fountain pen isn’t going to magically improve your handwriting, I think that if you’re using tools that you love, you’ll practice longer and harder. Anyway, I know that’s true for me. I’ve filled up plenty of Rhodia pads just writing nonsense, forming letters over and over again, writing my name. At the 2013 DC Pen Show, I took a 3-hour Copperplate workshop with Deborah Basel and re-kindled my love of calligraphy practice. I could sit forever and write one letter over and over and over again— which is basically what Deb had us doing. In the course of those 3-hours, I went from making tentative and scratchy “O’s” to forming letters that looked pretty decent. I eventually relaxed my death grip on the oblique nib holder and let my writing flow. Fun stuff! But alas, the Copperplate textbook I purchased from Deborah has been gathering dust since that show. 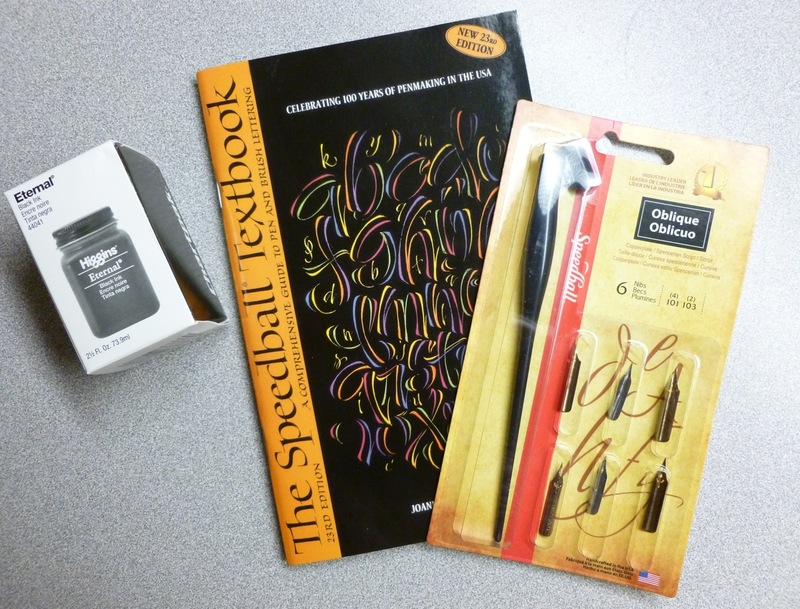 I recently noticed that JetPens is carrying Speedball calligraphy products, so using a little sponsorship money, I purchased the Speedball Textbook, a Speedball Oblique Pen Set, and bottle of Higgins Eternal Black Ink. Time to blow the dust off of my practice books and hunker down. 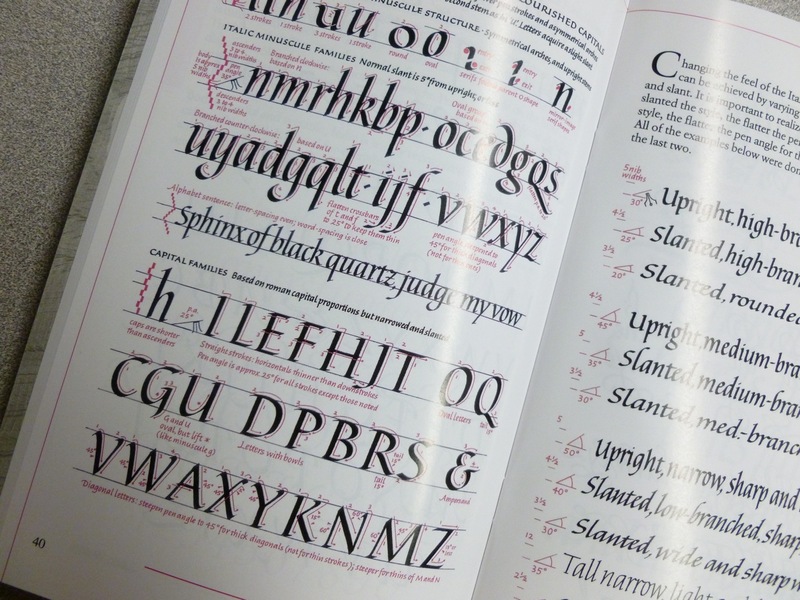 The Speedball Textbook’s ninety-six pages cover the history of calligraphy as well a brief overview of several alphabet styles. This is a good book for picking out a style that interests you, then dabbling in it a bit. For in-depth study, you’ll probably need a guide devoted entirely to the alphabet style that speaks to you. The Speedball Oblique Pen Set comes with a plastic nib holder and six nibs— perfect for getting your Copperplate practice underway. 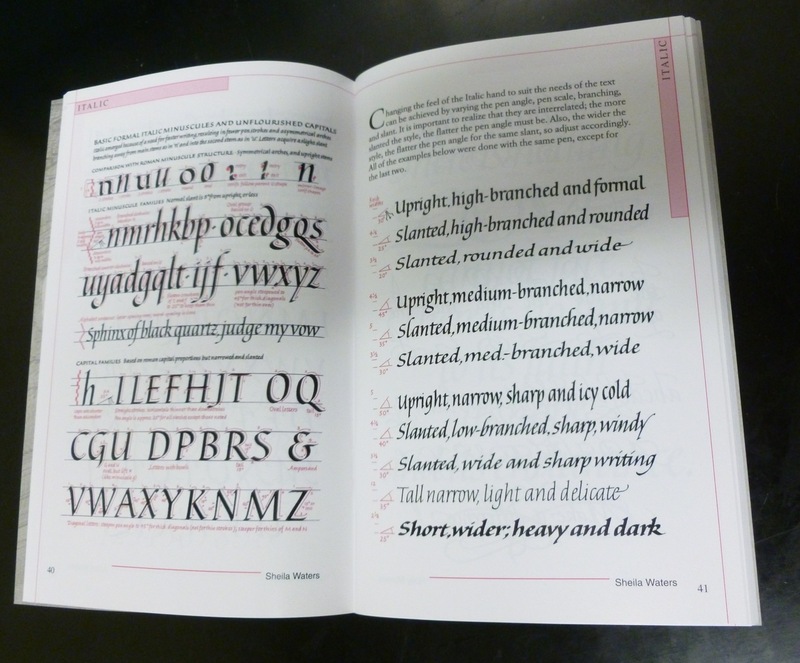 The Eternal Higgins Black Ink is the same ink that I used in the Copperplate workshop. If Deborah Basel uses it, it’s good enough for me. I’m looking forward to carving out some time to slow down with pen and ink and practice sheets to really work on my Copperplate script. Who knows what changes it might bring to my handwriting? 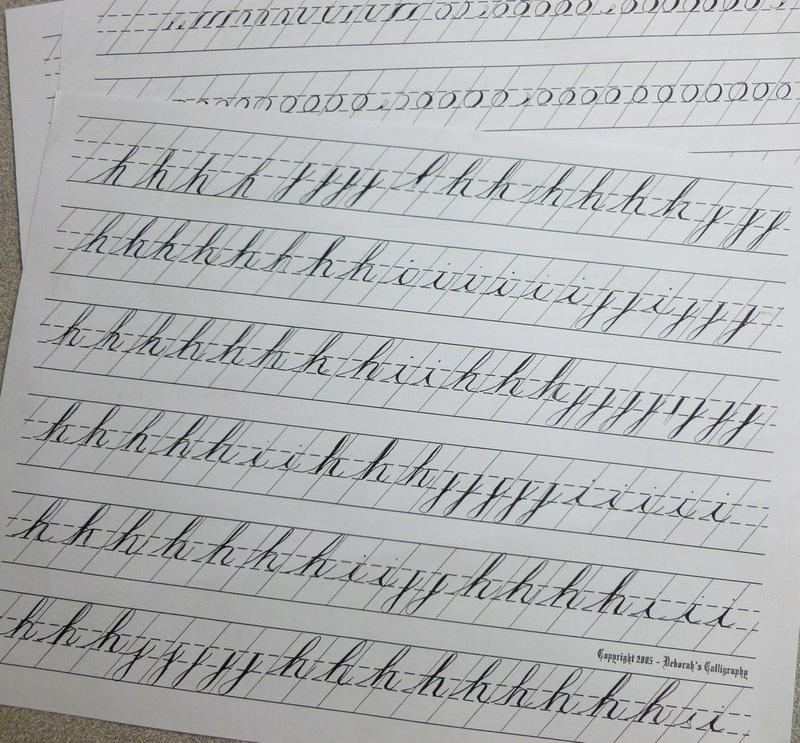 SOOOO…how do you improve your handwriting? The same way you get to Carnegie Hall— practice, practice, practice.